It was one of those days and I needed to get dinner on the table fast. I didn’t want to have to go out in this cold to the grocery store so I used what I had on hand. This recipe turned out wonderful and I am going to have to cook this one again! The recipe below serves 2 people so if you need it to serve more then increase it accordingly. Press the Brown button on your pressure cooker. If you don’t have a brown function then do this part in a skillet. Put 2 tablespoons of coconut oil in bottom of pressure cooker. When the oil melts put the round steak in. Brown the round steak and then place it on a plate. Put bacon in pressure cooker and brown the bacon. Add the cooking sherry and deglaze the pot. Turn the brown function off. 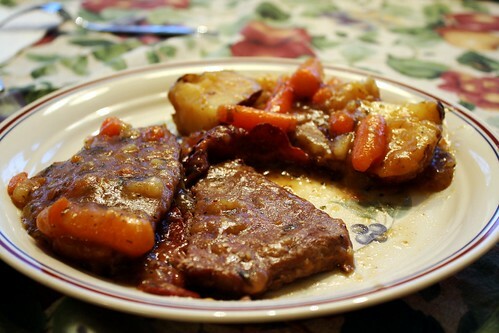 Return the steak and collected juices to the cooker. Add the remaining ingredients except for the cornstarch. I added some a little extra water too, maybe 1/4 cup. Lock the lid in place and set to high pressure for 20 minutes. Let pressure release. Remove the lid. In a pyrex measuring cup place 2 tablespoons of cornstarch and some of the hot gravy in and stir it up. Pour it in the cooker and stir until the gravy gets thick. Posted on January 29, 2014 by cookingwithpizazzPosted in Beef, Pressure CookerTagged Beef, Food, Pressure Cooker, Recipe.